Sweden’s largest sports news site, Sportbladet (part of Aftonbladet/Schibsted), is a destination for millions of Swedes, and core coverage includes the English Premier League. Thanks to a collaboration with United Robots it is now possible to cover all matches the second the final whistle is blown – and do it simultaneously across several platforms. Sportbladet and international sport data supplier Sportradar, a long-standing partner, have been serving readers live stats and results from Swedish as well as international sports. Articles have been written by Sportbladet reporters and have largely focused on matches played by the bigger clubs. 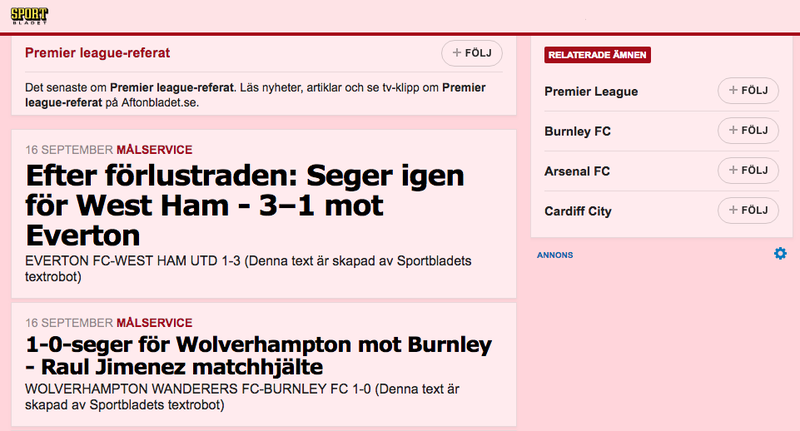 Working with United Robots, Sportbladet have now extended the English Premier League coverage. With the United Robot service articles are instantly generated for all matches the second they are over, based on Sportradar data. In addition tv-highlights are added to the articles, through Sportbladet’s collaboration with Viasat. “Speed and the ability to cover all matches in every round were key factors in this project,” says Sportbladet project manager Mattias Andersson. With the follow functions of the Sportbladet site, readers can now be notified about all texts whether written by newspaper reporters or the Sportbladet text robot. Down the line, the project may also mean that it’ll be possible to free up time in the sports department. “At the moment we’re doing 10 automated articles a week. If we scale up the project we’ll be able to get more content to readers without manual intervention, and at the same time free up time for our reporters,” says Mattias Andersson.